I know you were probably hoping to see photos of Sweet Dreams today. I wish I had them but – people – have you seen our weather? It was in the 20s here on Monday and in the 30s here yesterday and that’s way too cold for an outside photo shoot. And this shawl is beautiful and deserves to have lovely photos taken outside without this poor photographer freezing her patootie off. I do have a photo for you, though. I took that on March 26, 2013 – exactly one year ago. 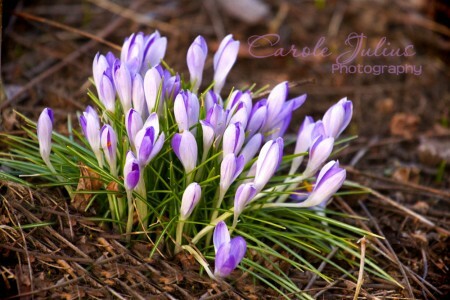 Today there are no crocus like that in my yard. Oh no. Today it is snowing. Our total could be less than 2 inches or more than 8, depending on which weather forecaster you choose to believe. And yet, the calendar says it’s spring. Spring. Yeah, right. All I can think of is one of my favorite lines from the movie The Princess Bride. Ha! No snow here so far, and I wouldn’t have minded. Figures. Over half the yard is still deep in snow. No croci. No snowdrops. No nothing. Ugh. Ugh. Ugh. So sick of this cold. Hope the snow total stays low! That quote is perfect! No snow here, thankfully. I did check the buds trying to push out of the ground. I swear they have retreated back underground a bit. Toooo coold! After 75 yesterday we’re expecting a little rain (maybe snow?). Spring is fickle and she’s all but jilted you in the north east. This is a winter that everyone is over…except Mother Nature! Once again, our crocci bloomed during a mid-winter warm spell–the only sign of spring is a robin who slimed my windshield! How’s that for a grim image? No snow here, for which I’m grateful. I hope it stops for you soon. Remember the old parkay margarine commercials? Somehow I think we managed to fool Mother Nature and she’s seriously pissed! Love the Princess Bride quote…I think the word he kept using was “inconceivable”. Kind of how I feel about Spring right now! it is truly ridiculous. wish I could send some warm sunshine your way, but we don’t have any either. I can’t wait to start complaining about the heat! Glad we only had a few flakes flying around, but the wind was ferocious and soooo cold. Pretty photo to dream about warmer weather.